My bread and butter sweet pickle chips are so simple to make, but huge on flavor and crunch. 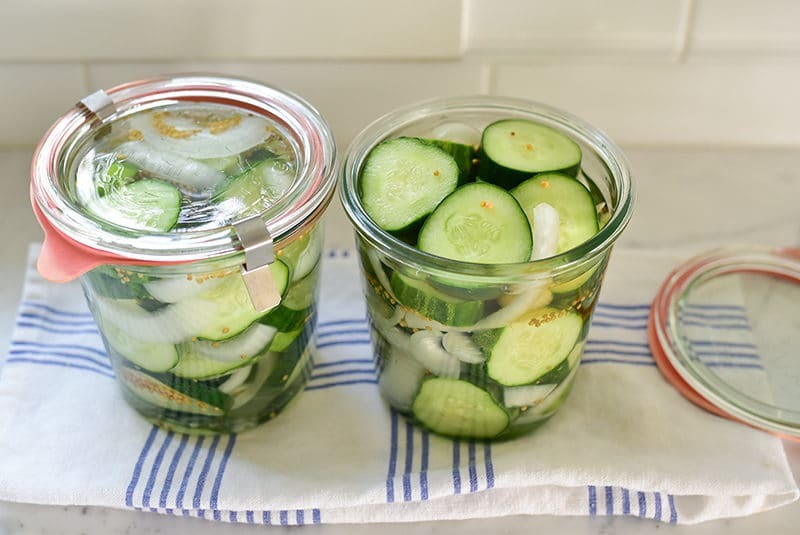 The sweet onion is as delicious as the cucumbers in these refrigerator pickles. Yes, we’ve had that long-awaited access to local fruit and vegetables and long afternoons out on the bay. Yes, we’ve enjoyed fresh herbs and mint galore from the garden. Yes, we’ve eaten an abundance of chips. In summer, it seems like every boat-picnic, every sandwich, every mid-afternoon crunch-craving is arrayed with chips, puffs, spirals . . . all of it. I can attribute the chip-factor to having kids around all of the time, and they keep bringing the chips in, but in reality I too count these food-like products among my guilty pleasures, that junk food I find most difficult to turn down. I kind of wish my junk food joy was more along the lines of fast food, because at least that would require me steering the car into the drive-thru, an act I could talk myself down from more easily. Dan admitted to a handful of some Frito BBQ honey spiral thing he had at the dealership this summer and how very crunchy, how very salty-sweet and “koo-koo” it was. Don’t you know that I would not rest until I had my own handful of the bad-boy koo-koo? Now, it’s also true that our lunch-crunch is made with chips of a higher order, with pickle chips. We eat a TON of pickles around here, from the babies to the Sittees. Do you same? 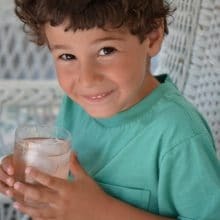 I know that pickles on the table three meals a day are a Mediterranean tradition, and a very Lebanese tradition, so maybe our constant pickle is rooted in that. While pretty much any pickle is welcome, I really want mine to crunch and have some body. For as long as I can remember, nary a sweet pickle is eaten in the presence of my mother that she doesn’t say that her mother made the BEST bread and butter pickles. 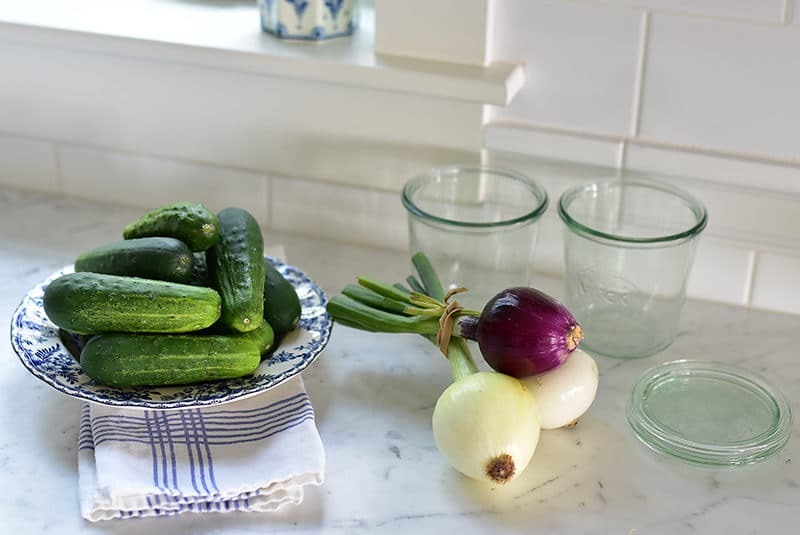 Alice put the thickly sliced sweet little cukes in a huge crock in the basement every fall and the family would feast until they were gone, which was always too fast. Why O Why did my mom not write down her mom’s recipe? And why didn’t she try to recreate the pickles years ago when my grandma’s method was still fresh in her mind? All I can say is that the “door closes/window opens” adage applies very much to my sweet pickle goals. One of my many, many cousins, Jim who I’ve mentioned before because he is my special cooking guru who does everything from sous vide to lemon ice cream (with lemons from his yard) and cultured butter in his kitchen, also does a perfect sweet pickle. He first told me about his pickles when I was living in San Francisco and he came visited for Thanksgiving. He gifted a beautiful jar to Dan and me for our hotel room stay when we were out his way a few years ago (along with other extraordinary hotel-room picnic treats…it was a stunner). I started in on his pickles and never looked back. The key is to keep the cuke crunchy and bright, and to give the sweet onion an equal footing to the cukes. As with salad, even if you don’t want to eat the onion (why though? ), it has to be in there for proper balance of flavor. We keep the process simple and avoid the heat that cooks and softens the pickles by making these refrigerator-style, where they’re kept cold and crisp, rather than on the shelf. I take this concept another step beyond by not cooking my pickling vinegar/sugar liquid. Just let the sugar dissolve without boiling; it may take a few minutes, but it’ll happen. Now that we’re full-boar in sweet pickle season, I make small batches often. Step aside, you devilish junk food chips. Summer is done and I’m done with you. Your koo-koo doesn’t hold a candle to my sweet cuke koo-koo pickle on my plate. 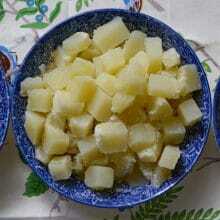 These are refrigerator pickles, so no heat processing is used. Fill the jars (I do love a Weck jar...) as tightly as possible with the pickles and onions, as they will shrink some as they pickle. This recipe is easily doubled, tripled, you name it. 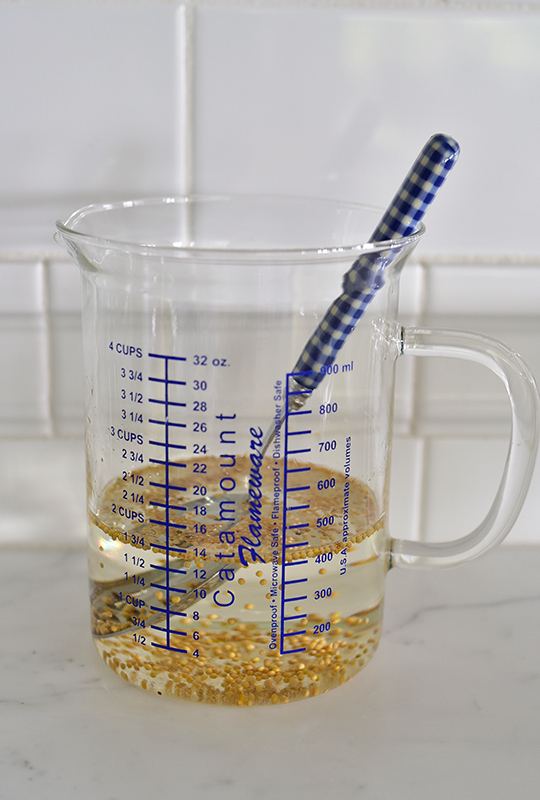 In a quart measuring cup or bowl, combine the vinegar and granulated sugar. Whisk occasionally, until the sugar is completely dissolved. Add the mustard seeds. Trim the ends of the cucumbers and discard. Slice into 1/4- to 1/2-inch rounds. Trim and slice the onion into 1/4- to 1/2-inch half-moon slices. 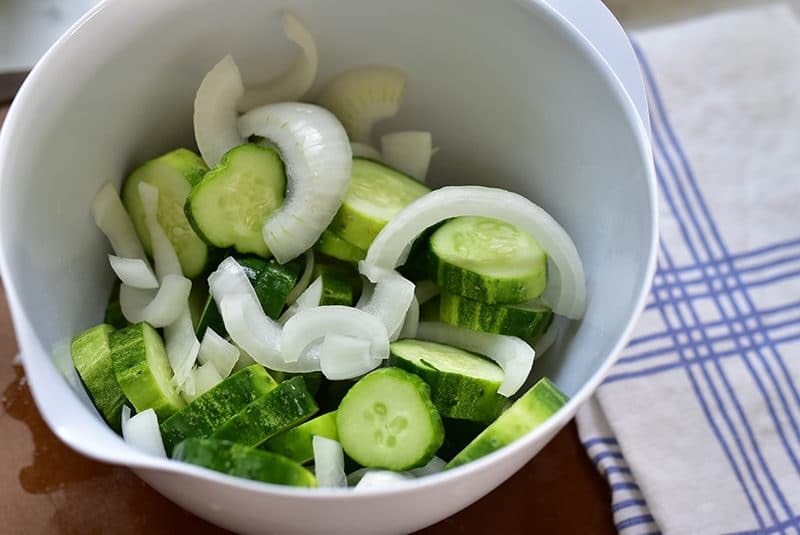 Toss the cucumbers and onions in a bowl to combine. 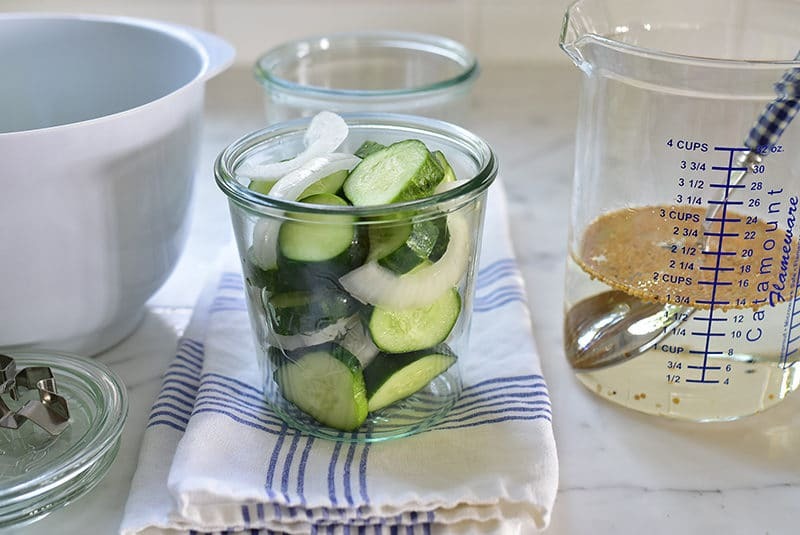 Pack the cucumbers and onions as tightly as possible in clean jars. Pour the pickling liquid over all in both jars, spooning the mustard seeds in to evenly distribute them. Close the lids and refrigerate for about two days before serving. 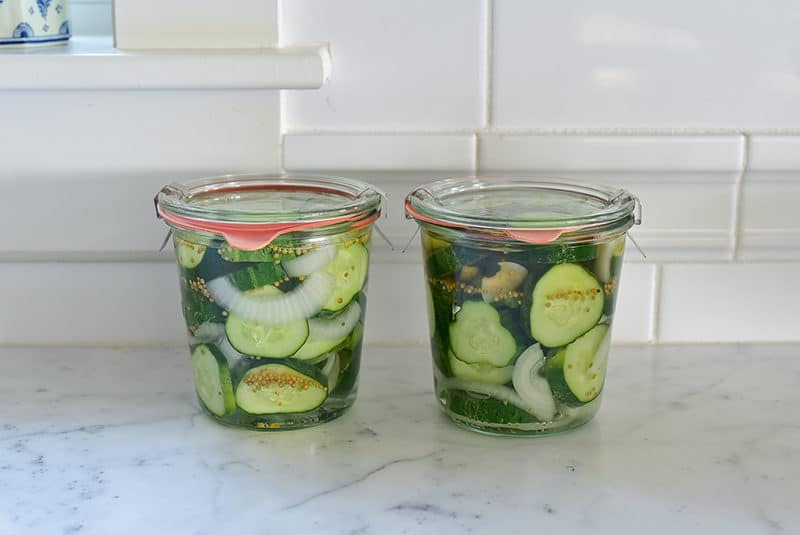 Pickles will stay nice in the refrigerator in their pickling liquid for a few weeks. 10 Responses to "Bread and Butter Sweet Pickle Chips"
These look so much better than store-bought. Can’t wait to make them! 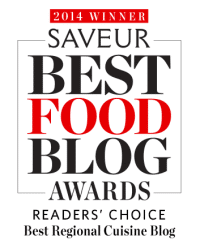 Maureen: I thoroughly enjoy your blog and your recipes are amazing. Thank you for sharing. 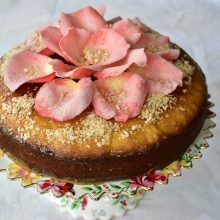 Good morning Maureen, and thank you for this wonderful recipe. I have been wanting to make a bread & butter relish. Do you think your recipe would work for a relish that will stay crunchy? Hi Judy–pickle relish is another process altogether, given that it’s saucy. That requires cooking. You may be able to make a cooked sweet relish and then add some of these bread and butter chips and onions, diced, for crunch and color! Delicious! I made with red onion and now have beautiful pickled onions as a bonus. I bet the red onion looks and tastes beautiful!